Friday, July 25, 1913: Not worth writing about. Since I knew my grandmother when she was much older than the teen in the diary, I’m constantly trying to reconcile how the young Helena in the diary evolved into the grandma I knew. Since it was a slow day a hundred years ago today, I’m going to share a memory that I have of Grandma as an older woman—when she actually was my grandmother. Every year when the hydrangeas bloom I think of Grandma. I can remember playing with my cousins—and seeing Grandma “watering” her hydrangeas with a can filled with something that wasn’t water. I ran over and asked what she was doing . 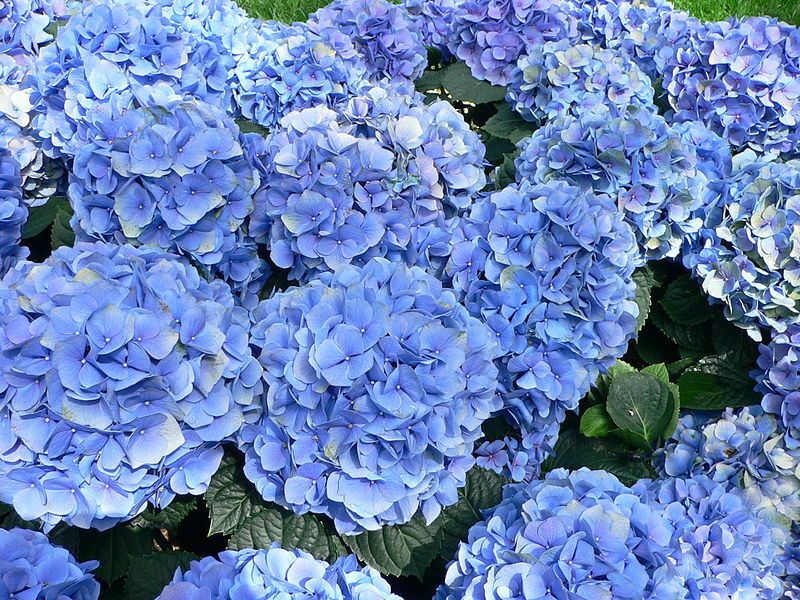 She explained how she needed to add aluminum sulfate to the soil to make the hydrangeas blue. I couldn’t understand how a flower could possibly change colors depending upon what was put on the soil—so I asked a zillion questions. And, I remember Grandma carefully and patiently answering each one. In many ways this story is very typical of many of my memories of Grandma. When I was a small child Grandma always welcomed questions and treated each question with respect. When I was a youngster, she treated me like an older person than almost anyone else I knew—but I always understood her answers and really liked that she knew that I was big enough to understand what she was saying when she explained complex things to me. Posted on July 25, 2013 July 24, 2013 by SherylPosted in OtherTagged diary, family history, genealogy. What a lovely memory, and tribute to your grandmother. Isn’t it a delightful challenge trying to know your grandmother before she was even married … ? Does her diary go on into later years? Will we get any sense of her meeting and marrying you grandfather? Grandma kept the diary for only 4 years (1911 through 1914). She actually knew my grandfather (Raymond Swartz) at the time she was keeping the diary. They both were in the same class in high school; however, she was 3 1/2 years older than him. I think that he skipped several grades. There were only 6 people in the graduating class. One of the diary’s mysteries is that Grandma never mentions by grandfather in the diary. All I can guess is that she had no interest in him at the time because he was so much younger than her. They got married when she was 26 and he was 21. Thank you for sharing this memory. You have the advantage of knowing who Helena grew to be. We know her in our imaginations based on everything you share with us. I do have the advantage of knowing who she grew up to be. However, I also find that I often use my imagination since in many ways the teen in the diary seems quirkier and more sensitive than my memories of the older woman who was my grandmother. Until I read your comment I had never heard of hydrangeas referred to as “Grandma Flowers”–but I really like it since I personally have always associated them with my grandmother. So interesting to hear a little more about Helena the grandmother. Perhaps she was treated in a respectful careful way by her elders or perhaps she learned patient communication on her life’s journey,or both :). It would be interesting to know how she learned how to patiently communicate with her young grandchildren. For me it is hard to imagine what being a teen girl in the years before WWI would be like. I am not surprised she doesn’t have anything to write about. It is an ever changing world but that change was much slower back then. She does sound depressed or at least bored but I think it just the times. By the time she was teaching you about gardening, she had experienced life and would have more to say about her day. Yes, life’s experiences do give us broader perspectives and more to say. It can be so difficult to be a teen. Aw, I love this memory of your grandma! My mom grew beautiful blue hydrangeas. My soil grows them pink, and, although I would love to have blue flowers, I just haven’t researched to know when to treat them with the right ingredients! Here’s the link to an excellent web page about how to change the color of hydrangeas. One of the most wonderful things an adult can do is take the time to properly answer a child’s questions. Weren’t you blessed to have a grandmother who did just that. Thanks for sharing such a lovely story. What a wonderful memory and thank you for sharing. How precious to have had a person like your grandma in your live. Though not my grandma, I had an elderly woman in my young live who took care of me often and had the same attitude. I felt truly loved by her and she taught me many useful lessons! And….she put copper pennies in the soil to make her hyndrageas blue! I never heard of using copper pennies to make hydrangeas blue until I read your comment, but is sounds like a fun, easy way to do it. This post, and everyone’s comments, are making me realize how much I like hydrangeas. Maybe I’ll have to buy a couple so that I can experiment with the colors. That is a lovely memory – I can see a kindhearted and compassionate person in your grandmother. When she writes “nothing to write about” I often think she had plenty to write to about that would have interested us today – such as showing you how to care for Hydrangeas. As with all of us, we often time think our daily lives are not that important. I often wonder too what she did on those days she had nothing to write about. It is so easy not to recognize the importance of our day-to-day activities. It’s interesting how reading Grandma’s words hundred years later enables us to see things that were opaque to her. My grandmother lived in a small ranch house on my uncle’s farm. It was about a mile from where I lived. I saw every few days during the summer months when I wasn’t in school–and somewhat less frequently during the rest of the year. And, I saw her every Sunday at church. It is so nice that your Grandma respected you so much and treated you that way. She wasn’t the “cuddly” type of grandmother–but I think that her personality and mine were similar so she was the perfect grandmother for me. I also like your story about your grandmother. I also like the diary entry. Not worth writing about – to me it seems that she is frustrated with something. I hope her luck starts to change soon. I think that it’s difficult for young people today to transition from their teen years to adulthood. Sometimes I think that the transition was even more difficult for young women a hundred years ago who did not get married at a very early age. Really loved your story about you and your Grandma Sheryl. How special that you really got to know her and spend time with her and now share he diary. I’ve heard that about Hydrangea’s but we don’t grow these big beautiful ones here (winters too cold), I love seeing them in the spring gardens in Vancouver, they’re everywhere’s there. I am very fortunate to have both the diary and the opportunity to know my grandmother. When I first saw the photo of the hydrangeas, my comment was going to be that they’re my favorite flower. Then I read the story and wanted to tell you that hydrangeas are my favorite flower because they grew prolifically in my *grandmother’s* garden. They remind me of her. Loved your story. My grandmother had a wonderful white hydrangea, a snow ball bush. I now have a small and very over shaded blue hydrangea bush near my mailbox. I guess the soil in Atlanta must naturally have what’s needed to make them blue because I haven’t given it anything extra in the past 7 years. There are blue bushes all over Atlanta. One day I’ll have to clear out around it and see if it will thrive. Interesting. . .it makes sense that some geographic areas would naturally have the right kind of soil to turn the flowers blue. I like this post as an insight into what your grandmother was like as an older person. She does appear to be quite graceful and you must have fond memories of her. .